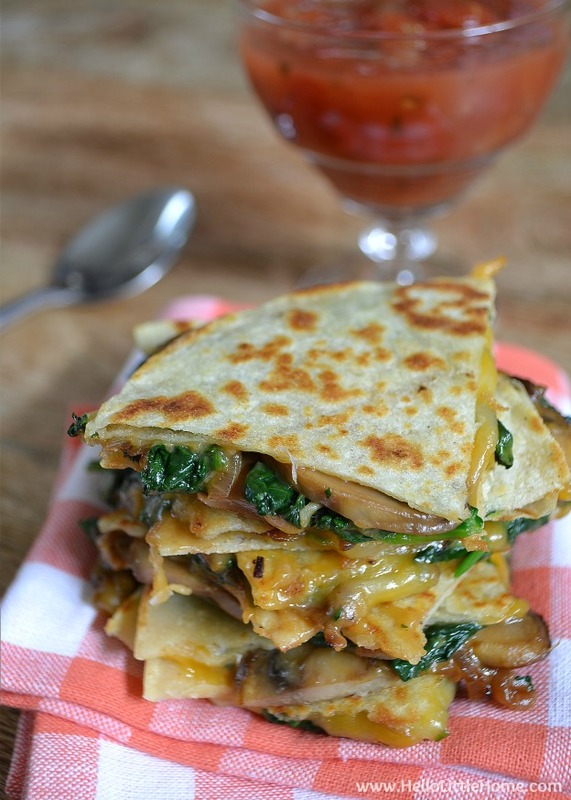 These delicious Mushroom and Spinach Quesadillas are packed with veggies and tons of place, plus they’re ready fast … make them for dinner tonight! If there is one cuisine I can never get enough of, it’s Mexican. Are you with me? With Cinco de Mayo just around the corner, I couldn’t resist sharing one of my favorite Mexican recipes. 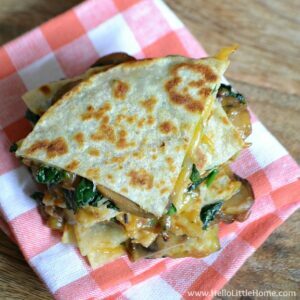 I love using lots of veggies in my cooking, and these Garlicky Mushroom and Spinach Quesadillas are no exception! Quesadillas are one of those comfort foods that I just can’t resist. It must be the cheese! 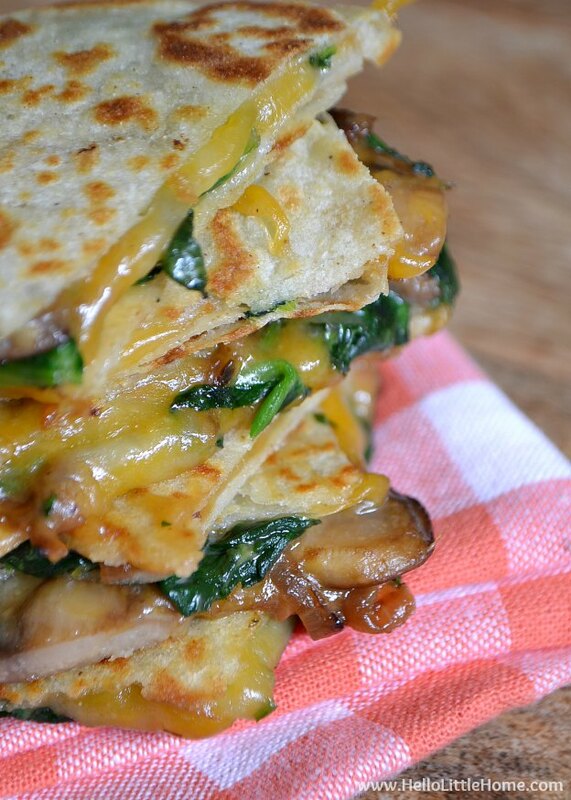 I’ve filled these quesadillas with a mixture of garlicky mushrooms and spinach. The healthy vegetables make me feel a little better about the cheese, and this quick-to-prepare filling is lip-smacking delicious, too. I like making quesadillas with corn tortillas, and that’s what I’ve used here. Corn tortillas are gluten-free, if that’s a concern for you, plus they lend more flavor than flour tortillas do. Sandwich the filling between two cheese topped tortillas, and you’ve got yourself one tasty quesadilla! These Mushroom and Spinach Quesadillas make a wonderful treat for Cinco de Mayo or for any occasion—weeknights included—so make a batch tonight. 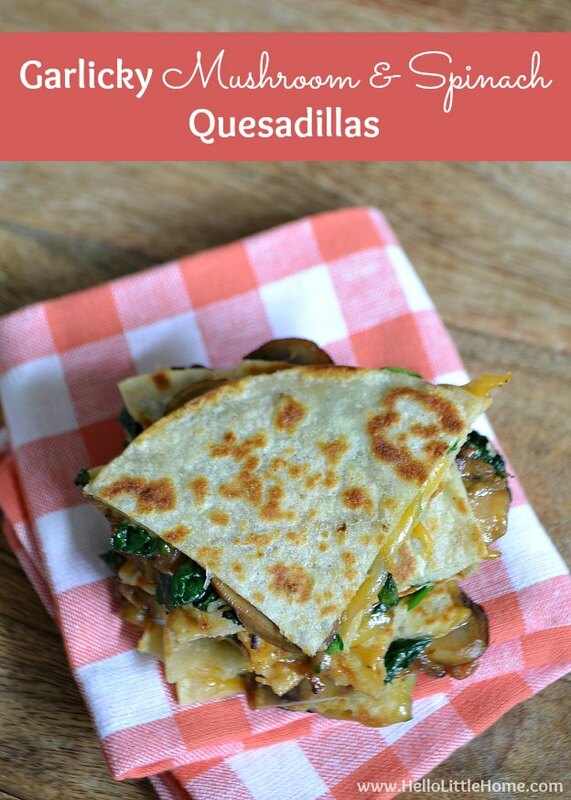 These yummy Mushroom and Spinach Quesadillas are packed with veggies and tons of flavor ... make them tonight! Heat 2 teaspoons olive oil in a large skillet over medium-high heat. Add onions to pan and cook, stirring occasionally, until they start to brown. Stir mushrooms into pan. Cook until any liquid the mushrooms release has evaporated, and they begin to brown. Reduce heat to medium, then finish cooking mushrooms until browned. Add garlic to pan, along with salt. Cook, stirring constantly, until garlic is fragrant (about 30 seconds). Stir spinach into pan and saute until just wilted. Season to taste with additional salt, if desired. Top one tortilla with 1/4 cup cheese, 1/4 of the vegetables, and then 1/4 cup cheese. Cover with another tortilla and then brush the tortilla with olive oil. Repeat process with the remaining ingredients. Place quesadillas in pan, oiled side down, then brush the opposite side with oil. Cook quesadillas until browned on bottom, then carefully flip, and cook until other side is browned. 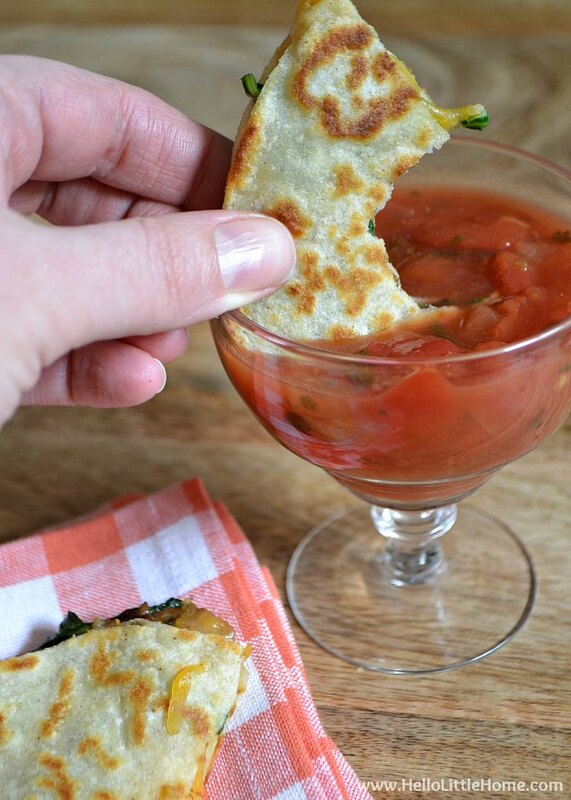 Serve quesadillas hot with salsa. Enjoy! What is your favorite quesadilla filling? P.S. If you are looking for Cinco de Mayo decorations, check out my free Fiesta Party Printables. Definitely pinned this! These look amazing!